On October 23, 2009, the Hawaii Board of Land and Natural Resources approved Hawaii Oceanic Technology, Inc.'s ("HOT") conservation district use application for an open ocean yellowfin and bigeye tuna fish farm located 3 miles due west of Malae Point, North Kohala, Island of Hawaii. Hawaii Oceanic Technology proposes to culture yellowfin and bigeye tuna using a closed loop aquaculture process, in which the fingerlings are grown from hatchery spawn of captured broodstock. 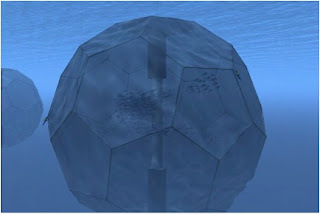 The company proposes to grow out the tuna to market size in offshore submerged cages, segregated by species, that are self-powered un-tethered 54m diameter “Oceanspheres.” The proposed ocean lease site is a one square kilometer (247-acre) site, 1,320-feet deep, located 2.6 nautical-miles offshore Malae Point, North Kohala. Twelve Oceanspheres will be deployed incrementally over four years, culminating with an annual production capacity of 6,000 tons. Fingerlings will be grown in land-based tanks at the Pacific Aquaculture and Coastal Resource Center in Hilo and/ or a future Natural Energy Laboratory Hawaii Authority tuna hatchery in Kona from eggs collected from locally-caught broodstock. About seven additional ahi would be caught each year in local waters to freshen the gene pool of the captured broodstock. The 12-inch, 5-pound fingerlings will be transferred by vessel to the Oceanspheres, and grown to 100-pound harvest size using dry fish feed through automated feed dispensers. The land base for operations and maintenance equipment, vessels, and staff will be Kawaihae Commercial Harbor. Tuna will be harvested at sea for transshipping through Kawaihae or Hilo Harbor to existing processing and packaging vendors for air-freight to US mainland, Japan, and Hawaii markets. Various concerns were raised during the draft EIS comment period including impacts on wild fisheries, water quality, disease from farmed fish, and possible entanglement of wildlife. HOT prepared a thorough response to comments section in its final EIS, and will mitigate environmental impacts through a design that does not use anchors or loose nets. It will also develop a Marine Mammal Management Plan, Shark Management Plan, and Endangered Species Management Plan and Emergency Management Plan. HOT's project is the nation's first tuna farm.